The models 6G Combo and WiFi Combo both include two radio modules. One radio module that ranges from 4850-6100 MHz is common to both. The 6G Combo's second radio module ranges from 15 - 2700 MHz, while the WiFi Combo's second radio module ranges from 2350-2550 MHz. Both the 6G Combo and WiFi Combo are dual-band diagnostic tools that are well suited for monitoring and troubleshooting both the 2.4x and 5.x GHz ISM bands used by Wi-Fi systems. From the device's built-in menu a user toggles which radio module is currently active -- they do not operate simultaneously. The models 3G Combo and 3G-24G Combo both include two radio modules. One radio module that ranges from 15-2700 MHz is common to both. The 3G Combo's second radio module ranges from 240-960 MHz, while the 3G-24G Combo's second radio module ranges from 2350-2550 MHz. We are often asked the reason for two radio modules — especially since the 15-2700 MHz radio module includes the frequency range covered by the other radio module. The answer is mostly explained by how the device evolved. Originally there were only narrow-band models, but when the frequency range was extended a design decision was made to “piggy-back” a 15-2700 MHz radio module on to one of the existing base models rather than start from scratch and create yet another device (which would have been more expensive). Since the 15-2700 MHz radio module includes the frequency range of the other radio module then it can be used for most applications. However, even though the 15-2700 MHz radio module includes the frequency range supported by the other radio module there are times when one might choose to use the more narrow band radio module. For example, if you are trouble-shooting a Wi-Fi problem then you would choose to use the 3G-24G Combo's 2350-2550 MHz radio module since you will get a little better performance compared to the broad band radio module. On the other hand, if you are working in the UHF range as an RF audio engineer then you will get a little better performance using the 240-960 MHz radio module. Also, each radio module uses a different antenna, which will affect the sensitivity in the frequency range you are working in. In the end, either model will work fine -- even if one radio module has a slight performance advantage over another that should not significantly change the results you would get. And just to be clear, from the device's built-in menu a user toggles which radio module is currently active -- they do not operate simultaneously. 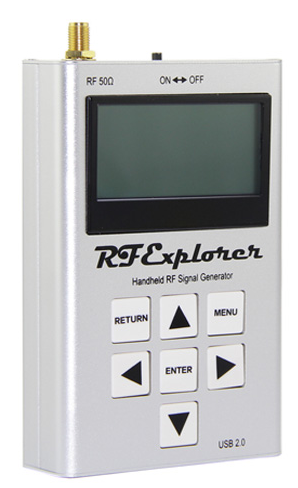 The RF Explorer Signal Generator (RFE6Gen) is a powerful, wideband (6 GHz), fully programmable RF signal generator. It is the perfect companion for the RF Explorer Spectrum Analyzer product line.